It also is considering drilling wells on its 265-acre site on the eastern side of Bogart, according to Oconee County Utility Department Director Chris Thomas. Athens-Clarke County will provide the treated water needed by Caterpillar, and that system has an adequate capacity to easily fill the needs of Caterpillar for the plant. The increased demand of Caterpillar for water came to light at a meeting of the Oconee County Industrial Development Authority on Jan. 3. Oconee County Attorney Daniel Haygood told the IDA that the water usage at the plant was going to be higher than Caterpillar actually said it was going to be. So Caterpillar has asked for a separate meter for sewer usage, he said. The IDA agreed to pay $55,000 for the meter, but only with the understanding Caterpillar will reimburse those costs. Documents submitted to the Northeast Georgia Regional Commission early last year indicated that the Caterpillar plant would require 65,000 gallons per day of water and generate 60,000 gallons per day of wastewater. Oconee County Utility Department Director Chris Thomas said Caterpillar at one point in the last six to eight months had said it would need 300,000 gallons per day by 2018 to 2020 and at another time even used a 500,000-gallons-per-day figure. These kinds of figures would have been nearly impossible for the Oconee County system to provide. Oconee County currently is producing 2.8 million gallons per day of water, and it has a capacity of only about 4 million gallons per day. Even the 150,000 gallon-per-day request would have put some pressure on the Oconee County system, Thomas said. The Athens-Clarke County Public Utilities Department, in contrast, treats and delivers about 15 million gallons of drinking water each day, according to the department’s web site. The system has the capacity to produce 36 million gallons per day, the site states. Oconee and Athens-Clarke County have agreed to cooperate in providing water and sewer services to Caterpillar. The two counties will pool costs and revenues. The current plan is for Clarke County to provide sewage treatment for the plant as well as water service. Thomas said Oconee County might provide some water and sewer services at some point as the project moves forward. At the Jan. 8 meeting of the Oconee County Board of Commissioners, Thomas and county consultant Jimmy Parker of Precision Planning Inc. of Monroe warned the commissioners that Oconee County is ill prepared to meet the water needs of big industrial users. 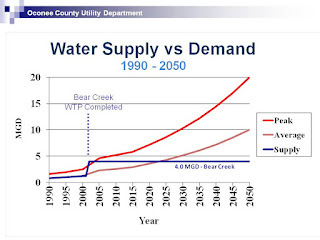 Water demand already is exceeding supply during peak periods, the two said in making the case for the county’s participation in the Hard Labor Creek Regional Reservoir project. Parker explained to me in a telephone conversation on Jan. 11 that the county is dealing with this problem by supplementing the 4 million gallons per day of water it gets from the Bear Creek reservoir in Jackson County with water pumped from county wells. In addition, Parker said, the county can store 1.75 million gallons of water in its storage tanks and use that water when demand exceeds supply. Parker said that 2018 is the turning point for when he projects that the county will not be able to balance supply and demand. 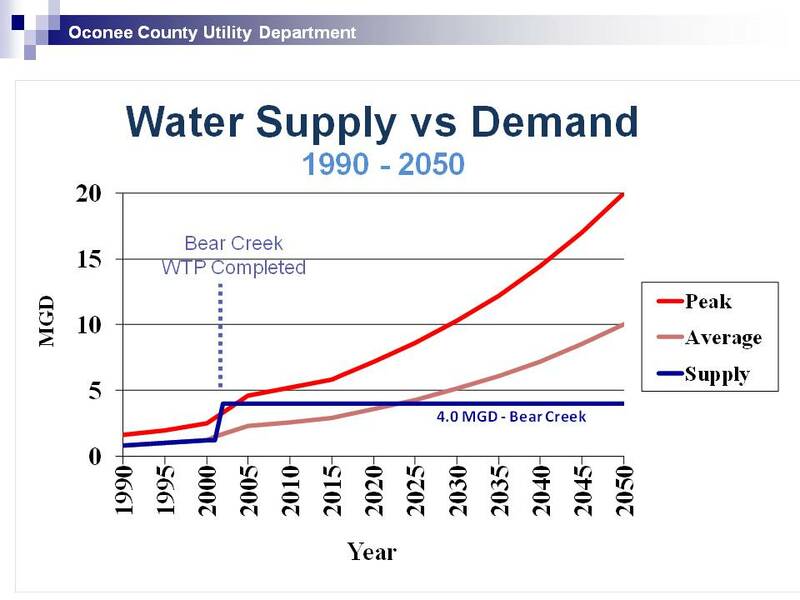 That also is the projected date for when water will become available from the Hard Labor Creek reservoir. The revenues to pay off Oconee County debt for the Hard Labor Creek and the Bear Creek reservoirs at present is born only by water users in the county, who all live in the northern part of the county. To the extent water is used to entice or accommodate industrial users, those water customers are carrying the financial burden of development for the whole county. Drilling wells is only one of the options Caterpillar is discussing at present to supplement the 150,000 gallons of water it has agreed to purchase from Clarke County, Thomas told me when I talked with him by telephone on Jan. 10. It also will reuse water and capture condensation water from the manufacturing process, he said. Thomas said Caterpillar would not need a state permit to drill the wells, since the water would be used on site. The plant borders U.S. 78 and the Atlanta Highway (U.S. 29) as well as the city of Bogart. Thomas said it was difficult to know if Caterpillar will find any water on the site. Oconee County does have one well producing a small amount of water nearby, he said. Thomas said the utility department officials actually proposed to Caterpillar that it meter its sewage rather than pay based on water usage. The concern was that the counties would not get full compensation for sewage treated if Caterpillar reduced its treated water usage by drilling the wells and capturing water during manufacturing, he said. The plan is to use what is called a Parshall Flume to measure sewage flow. A narrowing, or flume, is created in the outflow pipe, and flow rates above and below the flume are calculated as a way of measuring the amount of water that goes into sewer lines and ultimately to the treatment plant. The only other customer in Oconee county currently metering sewage flow is AmeriPride in Watkinsville, Thomas said. Most of the Caterpillar plant itself actually will be in Oconee County. Oconee County is responsible for permitting for the plant, following joint Oconee County and Clarke County compliance inspections. B.R. White, head of the Oconee County Code Enforcement Office, told me in an email message today that a final plat for the site is expected to be submitted within the next two weeks. The goal is to issue a temporary certificate of occupancy on March 8 for a part of the building that can be used to set up and test equipment and for the training of employees, White wrote. Occupancy certificates then will be issued as subsequent buildings are completed. Caterpillar on Jan. 28 announced it is expecting sales and revenues in 2013 to be between $60 and $68 billion and profit per share to be between $7 and $9. The Peoria, Ill., firm reported 2012 sales and revenues of $65.9 billion, an increase of 10 percent from $60.1 billion in 2011. Profit per share in 2012 of $8.48 was up 15 percent from $7.40 in 2011. “The range of our 2013 outlook reflects the level of uncertainty we see in the world today,” said Oberhelman, as quoted in the news release. “We're encouraged by recent improvements in economic indicators, but remain cautious,” the release quotes Oberhelman as saying. “While we expect some improvement in the U.S. economy, growth is expected to be relatively weak. “We believe China's economy will continue to improve, but not to the growth rates of 2010 and 2011. We also remain concerned about Europe and expect economies in that region will continue to struggle in 2013. The news release made no mention of the implications of a slowdown on any of Caterpillar’s operations, including at the new plant in Oconee County.